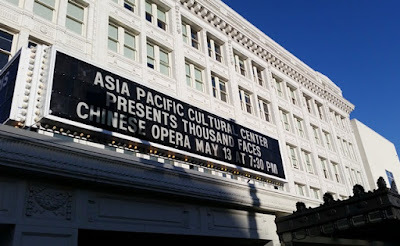 On May 13th, Asia Pacific Cultural Center hosted the Thousand Faces Chinese Opera performance at Tacoma's Pantages Theater with Masters of Ceremony Baole Zhao and Lucy Meng. The evening was filled with beauty, action, drama, and comedy! 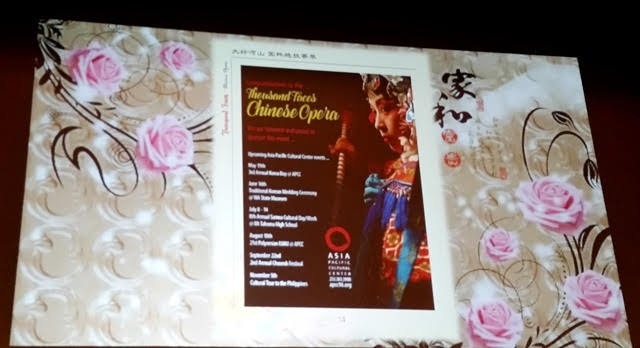 Chinese Opera Arias Medley including pieces from Sichuan Opera performed by Gang Kong and Jia Yu, Beijing Opera "The Huai River Camp" performed by Bing He, Shanghai Opera performed by Wendy Wu Xia Dickmann, and Cantonese Opera performed by Linh Tan and Huishao Zhen. In this piece, Hu Sanniang must fight on horseback against the surprisingly short general, Wang Ying (Hu Sanniang's future husband). In this piece, the husband must perform increasingly difficult acrobatic tasks for his wife, all while keeping a lit lamp steady on his head. Part performance art and part tea ceremony, this art form developed from a time when the Emperor feared assassination attempts. A teapot with an exceptionally long spout was created to pour tea without being within reach of the Emperor and the pouring technique developed into a beautiful combination of dance and tea service. This piece comes from one of the most famous operas. In this scene, Xiang Yu has been surrounded by the armies of Liu Bang. His concubine, Yu, wishes to die with him and he refuses. Yu performs a final sword dance for her king and, when he becomes distracted, uses the sword to commit suicide. At the close of a stellar performance, members of the audience were invited to join the actors for photographs.